On a trip to the farmers' market with her parents, Sophie chooses a squash, but instead of letting her mom cook it, she names it Bernice. From then on, Sophie brings Bernice everywhere, despite her parents' gentle warnings that Bernice will begin to rot. As winter nears, Sophie does start to notice changes.... What's a girl to do when the squash she loves is in trouble? 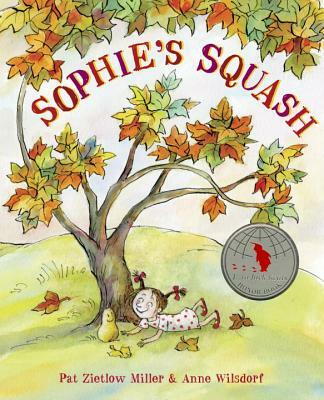 The recipient of four starred reviews, an Ezra Jack Keats New Writer Honor, and a Charlotte Zolotow Honor, Sophie's Squash will be a fresh addition to any collection of autumn books. PAT ZIETLOW MILLER received an Ezra Jack Keats New Writer Honor for Sophie's Squash, her picture book debut, which was published to four starred reviews and named a Charlotte Zolotow Honor Book. The book is based on a true story—Pat's own daughter, Sonia, once loved a squash. She lives in Madison, Wisconsin. Visit the author at patzietlowmiller.com. ANNE WILSDORF is the illustrator of numerous books for children, including Dogs on the Bed by Elizabeth Bluemle, The Best Story by Eileen Spinelli, Alligator Sue by Sharon Arms Doucet, and the Ruby Lu series by Lenore Look. She lives and works in Lausanne, Switzerland. "In a perfect blend of story and art, the humorous watercolor-and-ink illustrations are bursting with color and energy on every page... This is a paean to love and friendship, which can come in all species, shapes, and sizes." "With lessons on life, love, and vegetable gardening, this tale will be cherished by children, and their parents will be happy to read it to them often." "Sensitive but funny... Miller’s easygoing storytelling taps into the familiar scenario of children making fierce attachments to favorite objects." "This season-spanning turn with high-spirited Sophie offers endearing lessons about nurture and regeneration."